Size. 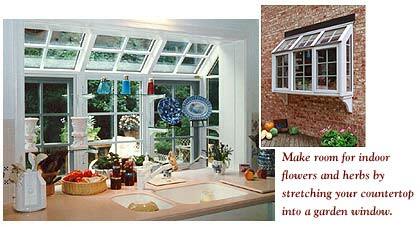 Garden windows can be built to fit almost any opening. However, many companies offer less-expensive stock sizes to accommodate standard window openings. Glass. Because a garden window contains a lot of glass-at least four separate sheets-building codes often specify the type of glass that is used. The glass in the overhead pane gets the most attention; here, as with skylights, codes usually call for tempered or laminated safety glass to protect against hail damage. Ideally, the entire window should be made of low-emissivity (often called low-E) glass; it may not be required by code but it will help keep summer heat out and winter heat inside. Window type. Garden windows are generally casements (where the window is hinged at the side to swing out) or awnings (where it's hinged at the top to swing up). Others have fixed glass and remain closed. Frame. Garden windows, like conventional windows, come in wood, vinyl, and aluminum. The type you choose depends on what's important to you: Wood and vinyl offer the best insulating values; vinyl promises the least maintenance; wood provides a natural look; and aluminum is the least expensive. Recent technology has largely solved the leaking problems that garden windows had in the 1970s and 1980s, but it's wise to purchase your window from a high-quality manufacturer. Muntins. True divided-light garden windows, where separate panes of glass make up a sash, are available. But many of today's windows have a simulated divided-light look, meaning the muntin grilles are only decorative. This costs less and makes for easier-to-clean windows. For a contemporary setting, however, choose a window without a grille. Seat. The seat, or base of the window, is often surfaced with plastic laminate. Laminate is inexpensive, durable, stain resistant, and available in colors to match your room's décor. Other popular surfacing choices include copper and wood. These materials stain more easily, however, so move plants when watering and wipe up spills immediately. Shelves. Glass, wood, or plastic-coated wire shelves allow you to double or triple your window space for plants or collectibles. Some manufacturers make shelves that are removable or adjustable to accommodate larger items, such as tall potted plants. Cost. Prices start at about $1,000. Installation, which involves support bracing, runs an additional $350 to $600 depending on the garden window's size and the age and condition of the window being replaced.